From the beginning of Los Punks, director Angela Boatwright sets the stage as she shows raw footage of a helicopter raid breaking up a backyard show in South Central Los Angeles. Snippets from subjects sing praise to the punk scene that LA has fostered in neighborhoods ranging from South Central, Boyle Heights, Compton and more, and soon we see that there’s a tight-knit community here where misfits have found a home. Starting with promoter and lead singer of Corrupted Youth, Nacho talks about creating a scene for himself when he found none that catered to a punk lifestyle. With the trust of his friends, he’ll log on to Facebook, post flyers around town, and scout out houses to bring in a crowd for their weekend night. As he explains how he got into the scene, he talks about how he didn’t feel like there even was a punk scene for him to get into when he was younger, so he crafted one from the ground up. It’s clear that he’s a key figure in the scene, and is ultimately the biggest factor for bringing in the crowds. Whether he signed up for it or not, this also means that he’s usually the one that talks to the police if a show gets raided. 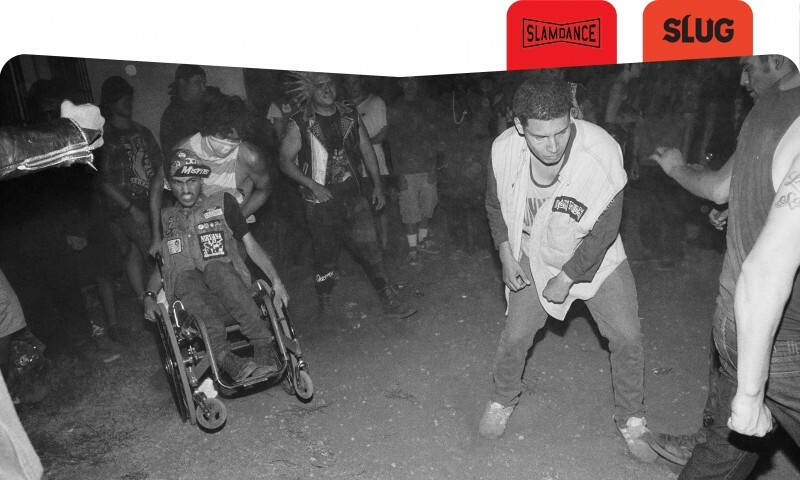 The subjects interviewed in Los Punks comprise mostly latinos in the scene, highlighting members from bands like Las Cochinas, Otherized, Psyk Ward, and more. We not only see how these subjects came into the scene, but we see the family behind them, whether through blood or by circumstance. What most of these punks seem to reflect on are the forces that have fucked them up—which could be a personal family issue, a broader social issue, or something else—and the scene allows them to hold onto their rage until the weekend to let it out in the pits. While some people may criticize the noise, behavior, and/or the drug and alcohol abuse of people who attend shows, ultimately this scene provides reasons to live, and gives purpose and pleasure as they interact in their community. For Alex, singer of Psyk Ward and aspiring chef, it allowed him to see that he should persevere through his pain rather than give up or lament in it. Gary, singer of Rhythmic Asylum, puts it into perspective under the term of la trizesta, representing the sadness of the hood to express the inner turmoil of these working class communities. Since there aren’t a lot of options to deal with this, escaping through music is often the vice of choice. What this family of misfits has created for themselves is pretty astounding, as their DIY attitudes create a space that has reached a point of self-sustainability. This doesn’t mean it’s invincible; Natalie, Nacho’s sister, admits that sometimes they have to pay out of pocket to make a show happen. Nonetheless, this family of punks is powerful. We see April, a 15-year old, gain experience as a self-started promoter so she can help pay for rent. Drums are exchanged between bands, and makeshift kits are created based on the materials available. These kids are not only having a blast, but they’re an inspiring example of what individuals can contribute to create an intentional life. Read our interview with director Angela Boatwright about Los Punks here.